Dynamic modeling is the fundamental building block for mechanism analysis, design, control and performance evaluation. One class of mechanism, legged machines, have multiple closed-chains established through intermittent ground contacts. Further, walking on natural terrain introduces nonlinear system compliance in the forms of foot sinkage and slippage. Closed-chains constrain the possible motions of a mechanism while compliances affect the redistribution of forces throughout the system. 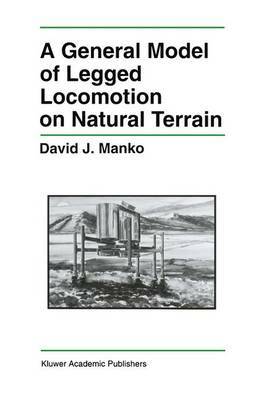 A General Model of Legged Locomotion on Natural Terrain develops a dynamic mechanism model that characterizes indeterminate interactions of a closed-chain robot with its environment. The approach is applicable to any closed-chain mechanism with sufficient contact compliance, although legged locomotion on natural terrain is chosen to illustrate the methodology. The modeling and solution procedures are general to all walking machine configurations, including bipeds, quadrupeds, beam-walkers and hopping machines. This work develops a functional model of legged locomotion that incorporates, for the first time, non-conservative foot-soil interactions in a nonlinear dynamic formulation. The model was applied to a prototype walking machine, and simulations generated significant insights into walking machine performance on natural terrain. The simulations are original and essential contributions to the design, evaluation and control of these complex robot systems. While posed in the context of walking machines, the approach has wider applicability to rolling locomotors, cooperating manipulators, multi-fingered hands, and prehensile agents.